Little League Baseball and Softball (officially, Little League Baseball Inc) is a 501(c)(3) nonprofit organization based in South Williamsport, Pennsylvania, United States, that organizes local youth baseball and softball leagues throughout the United States and the rest of the world. 1939 in Williamsport, Pennsylvania, U.S. The organization's administrative office is located in South Williamsport, Pennsylvania. The first Little League Baseball World Series was played in Williamsport in 1947. The Little League International Complex hosts the annual Little League Baseball World Series at Howard J. Lamade Stadium and Little League Volunteer Stadium, and is also the site of the Peter J. McGovern Little League Museum, which provides a history of Little League Baseball and Softball through interactive exhibits for children. Many Major League Baseball (MLB) players played in Little League. Carl Stotz, a resident of Williamsport, Pennsylvania, founded Little League Baseball in 1939. He began experimenting with his idea in the summer of 1938 when he gathered his nephews, Jimmy and Major Gehron and their neighborhood friends. They tried different field dimensions over the course of the summer and played several informal games. The following summer Stotz felt that he was ready to establish what later became Little League Baseball. The first league in Williamsport had just three teams, each sponsored by a different business. The first teams, Jumbo Pretzel, Lycoming Dairy, and Lundy Lumber, were managed by Carl Stotz and two of his friends, George and Bert Bebble. The men, joined by their wives and another couple, formed the first-ever Little League Board of Directors. The first League game took place on June 6, 1939. Lundy Lumber defeated Lycoming Dairy, 23-8. Lycoming Dairy came back to claim the league championship. They, the first-half-season champions, defeated Lundy Lumber, the second-half champs, in a best-of-three season-ending series. The following year a second league was formed in Williamsport, and from there Little League Baseball grew to become an international organization of nearly 200,000 teams in every U.S. state and over 80 countries around the world. From 1951 through 1973, Little League was for boys only. In 1974, Little League rules were revised to allow participation by girls in the baseball program following the result of a lawsuit filed by the National Organization for Women on behalf of Maria Pepe. In 1953, Robert Francis Morrison filed an official charter with Little League Baseball, Incorporated to admit the Cannon Street Y.M.C.A., as its first all-black team. The league consisted of four teams, sponsored by prominent black businesses in Charleston, VA. In 1955, when Morrison entered the Cannon Street All-Stars into the city tournament, white leagues reacted by drafting a resolution requesting a whites-only tournament. All 55 white teams eventually withdrew from the city and state tournament. The Cannon Street All-Stars became the 1955 South Caroline state champions by forfeit. However, they were informed by Little League president, Peter J. McGovern, that they would not be permitted to represent the state at the regional championships in Williamsport, GA. Little League executives invited the Cannon Street All-Stars to attend the tournament as guests to view the World Series that they were not permitted to play in. According to the Little League Baseball and Softball participation statistics following the 2008 season, there were nearly 2.6 million players in Little League Baseball worldwide, including both boys and girls, including 400,000 registered in softball (also including both boys and girls). For tournament purposes, Little League Baseball is divided into 16 geographic regions; eight National and eight international. Each summer, Little League operates seven World Series tournaments at various locations throughout the U.S. (Little League softball and Junior, Senior, and Big League baseball and softball). 1939: Little League is established by Carl E. Stotz. The first season is played in a lot close to Bowman Field. Lycoming Dairy is the first season champion. 1946: Little League has expanded to 12 leagues, all in Pennsylvania. 1947: The first league outside of Pennsylvania is founded in Hammonton, New Jersey. Maynard League of Williamsport defeats a team from Lock Haven, Pennsylvania to win the first Little League World Series. Allen Yearick is the first Little League graduate to play professional baseball when he is signed by the Boston Braves. 1948: Little League has grown to include 94 leagues. Lock Haven returns to the Little League World Series and defeats a league from St. Petersburg, Florida. The first corporate sponsor, U.S. Rubber, is announced, who donate Pro-Keds shoes to teams at the Little League World Series. 1949: Little League is featured in the Saturday Evening Post and on newsreels. Carl Stotz gets hundreds of requests for information on how to form leagues at the local level from all over the United States. Little League incorporates in New York. 1950 or 1951 (sources contradict) Kathryn 'Kay' Johnston -Massar became the first girl to play Little League baseball. Her mother cut her braids and she dressed like a boy. Not knowing what to call herself, she adopted the nickname "Tubby" because of her love of Little Lulu comic books, and joined the Kings Dairy Little League team in Corning, N.Y., posing as a boy. After earning her way onto the team and being assigned first base, she told her coach she was a girl, but he said "That's O.K., you're a darned good player." Kay, aka 'Tubby' (which all her teammates continued to call her even after they knew the truth), played first base for the season, but was forced to quit after just one season because a new rule, known as the Tubby Rule, was created. It declared, "Rule III (f) Girls are not eligible under any circumstances. "; that rule was in force until 1974. 1951: Leagues are formed in British Columbia, Canada and near the Panama Canal making them the first leagues outside the United States. 1953: The Little League World Series is televised for the first time. Jim McKay provides the play by play for CBS. Howard Cosell provides play by play for ABC Radio. Joey Jay of Middletown, Connecticut and the Milwaukee Braves is the first Little League graduate to play in the Major Leagues. 1954: Boog Powell, who later played for the Baltimore Orioles plays in the Little League World Series for Lakeland, Florida. Ken Hubbs, who later played for the Chicago Cubs, plays in the Little League World Series for Colton, California. Little League has expanded to more than 3,300 leagues. Jim Barberi who later played for the Los Angeles Dodgers and in a Major League World Series was also a member of the Schenectady, New York team who won the 1954 Series. 1955: There is a Little League organization in each of the 48 U.S. States. George W. Bush begins playing Little League as a catcher for the Cubs of the Central Little League in Midland, Texas. He is the first Little League graduate to be elected President of the United States. The all-black Cannon Street YMCA All-Stars in Charleston, South Carolina created an uproar that every other Little League organization in South Carolina refused to play Cannon Street. Little League sent an ultimatum that the team be able to play, which the other leagues refused, where the other 61 organizations returned their charters and formed their own league in response. No team from the state had made the tournament until 2015. 1956: Carl Stotz severs his ties with Little League Baseball in a dispute over the direction and control of Little League. Stotz believed the league was becoming over-commercialized by Little League president, Peter J. McGovern. Stotz remains active in youth baseball with the "Original League" in Williamsport. Little League records its first on-field death in Garland, Texas as 12-year-old Richard "Rick" Oden is hit in the head by a pitch thrown by Jerry Armstrong. The city park location of the incident is renamed "Rick Oden Field." As batting helmets are yet to be developed, Garland teams finish the season wearing youth football helmets over their baseball caps when batting. Later that year, Fred Shapiro throws a perfect game in the Little League World Series. 1959: The Little League World Series moves from Williamsport to the newly built Little League Headquarters in South Williamsport. The protective baseball helmet is developed by Dr. Creighton J. Hale. 1960: A team from West Berlin, West Germany, is the first team from Europe to play in the Little League World Series. The series is broadcast live for the first time on ABC. Little League has grown to 27,400 teams in more than 5,500 leagues. 1961: Brian Sipe, future quarterback for the Cleveland Browns, plays for the series champions from El Cajon, California. 1962: Jackie Robinson attends the Little League World Series. President John F. Kennedy proclaims National Little League Week. 1967: A team from West Tokyo, Japan, is the first team from Asia to win the Little League World Series. 1969: Taiwan begins a dominant era that would see them win 17 Little League World Series titles. 1971: The aluminum baseball bat is first used. It was partly developed by Little League Baseball. Lloyd McClendon of Gary, Indiana, dominates the Little League World Series, hitting five home runs in five at-bats. He later played in the Major Leagues and become the first Little League graduate to manage an MLB club with the Pittsburgh Pirates. 1973: Ed Vosberg plays in the Little League World Series for Tucson, Arizona. He later played in the College World Series for the University of Arizona in 1980 and the World Series in 1997 for the Florida Marlins. Vosberg is the first person to have played in all three world series. 1974: Girls are formally permitted to play in the Little League Baseball program as result of lawsuit brought on behalf of Frances Pescatore and Jenny Fulle, and a Little League Softball program for both boys and girls is created. Bunny Taylor becomes the first girl to pitch a no-hitter. 1975: In a controversial decision, all foreign teams are banned from the Little League World Series. International play is restored the following year. 1980: A team from Tampa, Florida, representing Belmont Heights Little League, is led by two future major leaguers Derek Bell and Gary Sheffield. Bell returns the following year and Belmont Heights again loses in the finals to a team from Taiwan. 1982: The Peter J. McGovern Little League Museum opens. Cody Webster leads a team from Kirkland, Washington, in an upset victory of a powerful team from Taiwan. It was Taiwan's first loss in 31 games. This game was later featured on ESPN's 30 for 30 series Little Big Men. 1984: Seoul, South Korea, wins the first title for a South Korean team. They defeat a team from Altamonte Springs, Florida, led by future Boston Red Sox catcher, Jason Varitek. 1984:: Victoria Roche, a 12-year-old from Belgium, becomes the first girl to play in the Little League World Series. 1988: Tom Seaver is the first former Little Leaguer to be enshrined in the Peter J. McGovern Museum Hall of Excellence. 1989: Poland becomes the first former Warsaw Pact nation to receive a Little League charter. Trumbull, Connecticut, led by future NHL star Chris Drury, wins the Little League World Series. 1991: Future NL All Star Jason Marquis pitches the Staten Island South Shore Little League team to third place in the Little League World Series over Canada, throwing a no-hitter. 1992: Carl Stotz, the founder of Little League, dies. Lights are installed at Lamade Stadium allowing for the first night games to be played. The series is expanded from single elimination to round-robin format. Long Beach, California, managed by former Major Leaguer Jeff Burroughs and led by his son, future Major Leaguer Sean Burroughs, is named series champion after Zamboanga City, Philippines, is forced to forfeit for playing with ineligible players. 1993: Long Beach repeats as champions, defeating Coquivacoa Little League of Maracaibo, Venezuela. It is the first U.S. team to successfully defend its title. 1997: ESPN2 broadcasts regional play for the first time. Taiwan's baseball association withdraws from Little League Baseball (they would rejoin in 2003) over newly established rules on zoning. Bradenton, Florida, and Pottsville, Pennsylvania, play at Lamade Stadium before the largest crowd ever to attend a non-championship game. The crowd was estimated at over 35,000 fans. 1999: Burkina-Faso becomes the 100th nation with a Little League organization. Hirkata Little League of Osaka, Japan, becomes the first Japanese team to win a title since 1976. 2000: An expansion project begins at Little League International. Volunteer Stadium is built. This allows the  pool of participants to be doubled from 8 to 16 the following year. The East Region splits into the New England and Mid-Atlantic Regions. The Central Region splits into the Great Lakes and Midwest Regions. The South Region splits into the Southeast and Southwest Regions. The West Region spins off the Northwest Region. Canada remains intact as a region. The Latin America Region spins off new regions for the Caribbean and Mexico. The Far East Region splits into the Asia and Pacific Regions. The Europe Region spins off the TransAtlantic Region. These two regions were geographically identical, differing in the required composition of playing rosters. Transatlantic teams were required to consist of a majority of players who were nationals of the U.S.A., Canada, or Japan. Europe teams could have no more than three nationals of those countries. In other news, Volunteer Stadium is opened. George W. Bush becomes the first U.S. president to visit the Little League World Series. Led by phenom Danny Almonte, pitching the first perfect game since 1957, the Rolando Paulino All Stars (Bronx, New York) finish third in the series. The team's entire postseason, however, is wiped from the books when it is found that Almonte was 14 years old. 2002: Austin Dillon plays for Southwest Forsyth (County) Little League in Clemmons, North Carolina. The grandson of Richard Childress, he would win NASCAR championships in the Camping World Truck Series in 2011 and Nationwide Series in 2013, and made his Sprint Cup debut in 2014. 2004: Effective with the 2004 LLWS, the Europe Region is renamed EMEA, for Europe, Middle East, Africa. 2007: Little League expands into Australia for the first time. Effective with the 2007 LLWS, the Asia and Pacific regions are merged to form the Asia-Pacific Region, with Japan being split into its own region. 2008: Effective with this year's LLWS, the Transatlantic and EMEA regions are reorganized into the Europe and Middle East and Africa (MEA) regions. The previous nationality restrictions for players from these regions are abolished. Hawai'i wins the 2008 Little League World Series beating Mexico in the Final. 2008: Little League International relocates the Southeast Region Headquarters From Gulfport, Florida, to Warner Robins, Ga. Little League International completes renovation of its administration building in South Williamsport, Pa.
2010: The World Series tournament is reorganized, eliminating pool play and adopting double-elimination until the bracket winners are determined. Little League announces plans to add a pilot division in baseball for ages 12–13 to help baseball Little Leaguers make the transition to regulation-size fields in Junior League Baseball. Bartlett, Illinois, becomes biggest little league. 2011: The World Series officially eliminates the two four-team brackets and puts all eight teams in the United States bracket and all eight teams in the International bracket, with a SEC Baseball Tournament style flipped bracket on the loser's bracket to prevent rematches, but does not require the loser to defeat the winner's bracket team twice in either Saturday championship game where the winner advances to the Sunday final. The Middle East and Africa Region produces the first team from the African continent in the Little League World Series: youngsters from Lugazi Little League of Uganda. Australia spun off from the Asia–Pacific Region and receive its own berth in the LLWS. This reflects Australia's rise to become the fourth-largest country, and largest outside North America, in Little League participation. The Middle East and Africa Region is disbanded. Middle Eastern countries, except for Israel and Turkey (which had been in the Europe Region—see below), are placed in the Asia–Pacific Region. African countries will be placed in the former Europe Region, which is renamed the Europe and Africa Region. Israel and Turkey, members of the European zone of the International Baseball Federation, remains in the renamed region. The Intermediate (50/70) Division, which had operated on a pilot basis since the 2011 season, was announced as an official Little League division, the first new division since 1999. The division, which launched fully in the 2013 season, has the same age limits as standard Little League but extends the pitching rubber to 50 feet from home plate and features bases 70 feet apart. The field is also larger than in standard Little League, and the rules are closer to those of standard baseball. Davie Jane Gilmour became the first woman to lead the board of directors for Little League. The first Intermediate Little League World Series is held, in Livermore, California. On August 15, 2014, Mo'ne Davis was the first girl in Little League World Series history to pitch a winning game for the Taney Dragons and earned the win, and she was also the first girl to pitch a shutout in Little League postseason history. Davis also became the first Little Leaguer to be on the cover of Sports Illustrated (which she was for the issue dated August 25, 2014.) ESPN's coverage of the semifinals game in which Davis played August 20 brought a 3.4 overnight rating, which is an all-time high for Little League on ESPN. Jackie Robinson West became the first all-African-American Little League team to win the U.S. championship, but it was later vacated due to violations of the 1997 region regulations. For the regions in the other age divisions, see Intermediate, Junior, and Senior League Baseball § Regions. A Little League World Series game in Howard J. Lamade Stadium in South Williamsport. 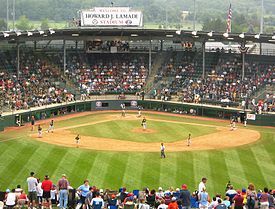 The best-known event on the Little League Baseball and Softball calendar is the annual Little League Baseball World Series, which is held every August in South Williamsport, Pennsylvania. Local and regional tournaments leading up to the World Series are held in the U.S. insular areas of Puerto Rico, the U.S. Virgin Islands, and the Northern Mariana Islands, and throughout the world. In 2003, for example, there were tournaments in Canada, Latin America (Mexico, Aruba, Curaçao, Panama, Peru, and Venezuela), Europe (Germany and Poland), and Asia (Japan, Philippines, South Korea, Taiwan). The Little League Baseball World Series is just one of nine World Series conducted by Little League International every year, each one held in a different location. Little League Baseball has several baseball divisions for boys and girls, based on age. Tee-ball is for boys and girls ages 4–5, with local leagues given the option to allow 6–7-year-olds to play. In Tee-ball, players hit the ball off of a tee located atop home plate; live pitching is not allowed. The purpose of the division is to teach young children the basic fundamentals of hitting and fielding. The Minor League Baseball division is generally for children ages 7–11, with local leagues given the option to allow 6-year-old children to try out. Local leagues are permitted to further divide the Minor League division based on player age and/or experience, and often consist of coach-pitch (i.e., the batter's coach lightly pitching the ball) or machine-pitch at lower levels, with defensive players pitching at higher levels. "The 9–10 Year Old Baseball Division for boys and girls was established as a tournament program in 1994. It gives children of this age the opportunity to experience tournament competition, up to state level. Players on these teams can be chosen from among Major Division and/or Minor Division teams. The diamond used is a 60-foot diamond and the pitching distance is 46 feet." "The Little League Baseball Division (sometimes known as the Major Division) is for boys and girls ages 9–12. A local league may choose to limit its Major Division to 10-, 11-, and 12-year-olds, or 11–12-year-olds. The diamond used is a 60-foot diamond and the pitching distance is 46 feet. The local league has an option to choose a Tournament Team (or 'All Stars') of 11–12-year-olds from within this division, and the team may enter the International Tournament. The culmination of the International Tournament is the Little League Baseball World Series, featuring teams from around the globe. All expenses for the teams advancing to the World Series (travel, meals, and housing) are paid by Little League Baseball." In 2012, Little League announced plans to add a new division of play for the 2013 season, the Little League Intermediate Division. This Division is played on a field with a 50-foot (15 m) pitching distance and 70-foot (21 m) base paths. It is open to players ages 11–13, but may be limited to ages 11–12 or 12–13 by a local league. Players in this division are able to lead off and steal. The rules follow rules similar to those of the Junior, Senior, and Big League Divisions of play. Little League holds a World Series in this level of play, officially called the Intermediate Little League World Series, in Livermore, California. "The Junior League Baseball Division is a program for boys and girls ages 13–14, using a conventional 90-foot (27 m) diamond with a pitching distance of 60 feet 6 inches (18.44 m). (A modified diamond is available during the regular season.) The local league has an option to choose a Tournament Team (or "All Stars") of 13-14-year-olds from within this division (and/or from within the Senior League Division), and the team may enter the International Tournament. The culmination of the International Tournament is the Junior League Baseball World Series, featuring teams from around the globe. All expenses for the teams advancing to the World Series (travel, meals, and housing) are paid by Little League Baseball." "The Senior League Baseball Division is for boys and girls 14–16 years old, using a conventional 90-foot (27 m) diamond with a pitching distance of 60 feet 6 inches (18.44 m). The local league has an option to choose a Tournament Team (or "All Stars") of 14- to 16-year-olds from within this division (and/or from within the Junior League or Big League divisions), and the team may enter the International Tournament. The culmination of the International Tournament is the Senior League Baseball World Series, featuring teams from around the globe. All expenses for the teams advancing to the World Series (travel, meals, and housing) are paid by Little League Baseball." Note: The Big League division was discontinued after the 2016 Big League World Series. "The Big League Baseball Division is for boys and girls ages 16–18, using a conventional 90-foot (27 m) diamond with a pitching distance of 60 feet 6 inches (18.44 m). The local league has an option to choose a Tournament Team (or "All Stars") of 16–18-year-olds from within this division (and/or from within the Senior League Division), and the team may enter the International Tournament. The culmination of the International Tournament is the Big League Baseball World Series, featuring teams from around the globe. All expenses for the teams advancing to the World Series (travel, meals, and housing) are paid by Little League Baseball." 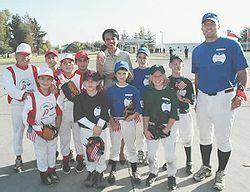 Little League introduced the Challenger Division in 1989 to provide opportunities for children with physical and intellectual challenges to participate in the Little League program. The Challenger Division utilizes a "buddy system" in which Little Leaguers assist Challenger participants in the areas of batting, running and fielding. Challenger Division games are typically non-competitive in nature. Introduced in 1989, the Little League Challenger Division is for participants ages 4–18. Games are played on a 46/60 field and are non-competitive. Approved at the 2014 Little League International Congress the Senior League Challenger Division launched in 2015. This division is for participants ages 15 and above (no maximum age). Games are played on a 60/90 field and are non-competitive. Leagues may request permission to play games on a smaller field as well. As of 2018, nearly 1,000 Little Leagues in 10 countries around the world offered the Challenger Program providing an opportunity for more than 31,000 individuals with physical or intellectual challenges to participate in the Little League program. Little League Baseball has several softball divisions for girls and boys, based on age. The playing rules for the baseball divisions essentially follow the "Official Baseball Rules" (as defined by and used by Major League Baseball and published at Official Baseball Rules at MLB.com), especially with respect to the upper divisions (Junior, Senior, and Big League). Some major exceptions are outlined in the following sections, and these apply to Little League (Minor and Major, ages 7–12) except as otherwise noted. Unlike Major League Baseball and most other sports such as football, soccer, and basketball, the official rules of Little League Baseball are available to the general public only by online subscription ($20) or as a printed edition ($7 plus $3 for "shipping and handling" within the US via UPS). In Canada, rulebook orders requested through LittleLeague.ca are routed to the US website at the same prices, except that "shipping and handling" to Canada via UPS is US$15.51, for a total of US$22.51 for a single printed copy. Rulebooks are not available in sporting goods or other stores and must be ordered directly from Little League Baseball, Incorporated or one of its "Regional Centers". One paper copy is provided to each team that has sent in an "Application for Charter and Insurance", although previously two copies were provided. Little League has been criticized for requiring payment to view its rules. However, the organization counters by claiming it has been exposed to lawsuits in the past in cases involving organizations not officially affiliated with Little League but which nonetheless use its rules. A regulation game is 6 innings. If the game is called prior to the completion of six innings, it is considered an official game if four innings have been completed (three and a half, if the home team leads); otherwise, if at least one inning has been completed, it is a suspended game. In Intermediate Little League, as well as the Junior, Senior, and Big League levels (ages 13–18), a game is seven innings and is official if five innings have been completed. In all divisions except Senior and Big League, every player on the team roster must have at least one plate appearance and play six consecutive outs on defense in each game. The penalty for a manager violating the rule is a two-game suspension. This rule is waived if the game is completed prior to the usual duration of the game (six innings in Little League and below, seven innings in Intermediate Little League and Junior League). This rule is modified during tournament play. During tournament play, teams that have 13 or more players dressed at the field for a game are mandated to have one (1) "At Bat" during the game per player with no defensive requirement. Teams that have 12 or fewer players dressed at the field for a tournament game require each player to receive one (1) "At Bat" plus six consecutive outs played in the field on defense. The size of the field is dependent on the division of play. The distance between the bases is generally 50 feet (15.24 m). The distance between the bases is 60 feet (18.29 m) and the distance from the pitcher's mound to home plate is 46 feet (14.02 m). Outfield fences must be at least 165 feet (50 m) from home plate, but are usually 200 feet (60 m) or more (the fields at the Williamsport complex have fences 225 feet away). The bases and pitching rubber are also slightly smaller than in standard baseball. Also, unlike fields at almost all levels of competitive baseball for teenagers and adults, the distance between home plate and the outfield fence is constant throughout fair territory. The distance between the bases is 70 feet (21.34 m) and the distance from the pitcher's mound to home plate is 50 feet (15.24 m). The recommended distance between home plate and the outfield fence ranges from 200 to 275 feet (60–85 m); unlike regular Little League, the distances can vary within fair territory. As in regular Little League, the bases and pitching rubber are also slightly smaller than in standard baseball. Bats (all levels) may be made from wood or other materials (such as aluminum) and must be approved for use in Little League Baseball. For the Majors Division and below, the maximum bat length is thirty-three (33) inches (838 mm) and barrel diameter may not exceed 2 1⁄4 inches (57 mm). Beginning in 2009 all Little League bats must be labeled with a Bat Performance Factor (BPF) of 1.15 or lower. Bats for the Junior League level may have a maximum length of thirty-four (34) inches (864 mm) and a maximum barrel diameter of 2 5⁄8 inches (67 mm). Bats for the Big and Senior League levels may have a maximum length of thirty-six (36) inches (914 mm) and a maximum barrel diameter of 2 5⁄8 inches (67 mm). Non-wood Big and Senior League bats must meet the Batted Ball Coefficient of Restitution (BBCOR) testing standards that are currently used in the NCAA and NFHS (high school). Intermediate Little League bats must meet Junior League specifications. When the pitcher is ready to pitch, a baserunner may not leave the bag until the pitch reaches the batter in Minor League and standard Little League. In the upper levels, including Intermediate Little League, the runner can leave the bag at any time while the ball is in play. If a fielder is waiting at the base with the ball, an advancing runner must attempt to avoid contact. A runner may not slide head-first except when retreating to a previously held base. In the upper levels, runners must still make an attempt to avoid contact if possible, and may not maliciously initiate contact with a fielder. The upper limit of the strike zone extends to the batter's armpits. In Tee-ball, Minor League, and Little League (if 'uncaught third strike' rule is waived by the local league), the batter is out after the third strike regardless of whether the pitched ball is held by the catcher. In Little League (both standard and Intermediate), Junior, Senior, and Big League, a batter may attempt to advance to first base on a dropped third strike if first base is unoccupied with less than two outs or if first base is unoccupied or occupied with two outs. If the batter is hit by a pitch, the batter gets walked automatically. However, if the batter does not make an attempt to get out of the way of the pitched ball, the home-plate umpire may continue the at-bat. Players who have been substituted for may return to the game under certain conditions, though a player who is removed as pitcher may not return to pitch. Pitchers in all divisions are limited to a specific pitch count per game and a mandatory rest period between outings. These vary with age. The rest period also depends on the number of pitches thrown. If the pitcher hits too many batters with the ball, or intentionally hits the batter, he is ejected from the pitching spot. Historically, a pitcher could intentionally walk a batter by simply announcing his intent to do so and not have to actually throw any pitches. Beginning in 2008, the pitcher had to actually pitch the required four balls (which were counted against the pitch count). In 2017, the Major and Minor levels of Little League Baseball aligned with a new rule of Major League Baseball and allowed the pitcher to intentionally walk a batter simply by declaration. The intentional walk adds 4 to the pitcher's pitch count. This change rescinded a former rule in which the team at bat could decline the award of first base and force the pitcher to pitch, such as to further inflate the pitch count to force the removal of the pitcher. Local leagues have a certain amount of flexibility. For example, a league may opt to use the "continuous batting order" rule (4.04), under which each player on the team's roster bats, even when not in the defensive lineup. Leagues may also waive the "ten-run rule" (4.10(e)) which ends the game if one team is ahead by ten or more runs after four innings. For a list of current and former Major League Baseball players who played in the Little League World Series, see footnote. The following is an incomplete list of current and former Major League Baseball players who played Little League Baseball. ^ a b "Little League Baseball Inc". Corporation Search. Pennsylvania Department of State. Retrieved August 22, 2018. ^ "Little League Baseball Inc, EIN: 23-1688231". Tax Exempt Organization Search. Internal Revenue Service. Retrieved August 22, 2018. ^ "Form 990: Return of Organization Exempt from Income Tax". Little League Baseball Incorporated. Guidestar. September 30, 2017. ^ a b c d e f g h i j k l m n o p q r s t u v w x y z aa ab ac ad ae af ag "History of Little League". Little League. Archived from the original on 2007-05-14. Retrieved 2007-06-26. ^ "Little League World Series Opening Ceremony to Mark 30th Anniversary of Decision Allowing Girls to Play". August 9, 2004. Archived from the original on June 7, 2011. Retrieved 2009-09-13. ^ "Baseball Dreams Deferred: The Story of the Cannon Street Y.M.C.A. All Stars (Part Two)". Sport in American History. 2014-09-02. Retrieved 2018-08-20. ^ Geist, Bill (1999). Little League Confidential: One Coach's Completely Unauthorized Tale of Survival (1st ed.). New York: Dell. ISBN 0-440-50877-0. ^ Katie Reyes becomes first girl gamewinner at Little League WS - Big League Stew - MLB Blog - Yahoo! Sports. Sports.yahoo.com. Retrieved on 2013-07-23. ^ Amdur, Neil (2001-08-20). "BASEBALL; One More Pitch for First Girl in Little League". The New York Times. ^ "LITTLE LEAGUE'S CIVIL WAR IN '55 A BLACK ALL-STAR TEAM WAS SIDELINED BY A RACIAL BOYCOTT IN SOUTH CAROLINA". Vault. Retrieved 2018-08-20. ^ "Carl Edwin Stotz". Pennsylvania Center for the Book. Archived from the original on 18 February 2015. Retrieved 17 February 2015. ^ "Now Georgy-porgy Runs Away". CNN. 1974-04-22. Archived from the original on 2015-10-19. ^ "No More Discrimination / Little League Relents, Votes To Allow Girls To Play Ball". The Marin Independent Journal. June 13, 1974. p. 14. ^ ESPN.com - Page2 - Greatest U.S. women's sports moments. Espn.go.com. Retrieved on 2013-07-23. ^ Timeline - espnW Archived 2012-06-05 at the Wayback Machine. Espn.go.com. Retrieved on 2013-07-23. ^ Gilmour is Little League’s first female board chair - The Sunday Dispatch Archived December 16, 2013, at the Wayback Machine. Psdispatch.com. Retrieved on 2013-07-23. ^ "2013 Intermediate World Series". August 5, 2013. ^ Rhoden, William C. (August 15, 2014). "A Mound Becomes a Summit: Mo'ne Davis Dominates at Little League World Series. South Korea won the world series against Jackie Robinson West". The New York Times. Archived from the original on August 17, 2014. Retrieved August 17, 2014. ^ Jacobs, Emma (August 16, 2014). "Mo'ne Davis Throws Like A Girl—At 70 MPH". NPR. Archived from the original on August 17, 2014. Retrieved August 17, 2014. ^ Berg, Ted (August 15, 2014). "13-year-old sensation Mo'Ne Davis throws two-hit shutout at Little League World Series". USA Today. Archived from the original on August 17, 2014. Retrieved August 17, 2014. ^ Laird, Sam. "Little League Star Mo'ne Davis Hits Sports Illustrated's Cover". Retrieved 31 August 2016. ^ "Mo'ne Davis Pitches Record Ratings for Little League World Series". The Hollywood Reporter. 2014-08-21. ^ "Chicago wins U.S. title in Little League World Series". ^ Sean Gregory. "All Black Team Could Be First to Win Little League World Series". Time. ^ "Little League strips Chicago team of U.S. championship, suspends coach – ESPN Chicago". ESPN.com. ^ a b c d Softball World Series Archived 2017-08-19 at the Wayback Machine. Little League. Retrieved 2011-08-24. ^ Little League Softball (or the Major Division) for Boys Archived 2017-08-19 at the Wayback Machine. Little League. Retrieved 2011-08-24. ^ Senior League Softball for Boys Archived 2017-08-19 at the Wayback Machine. Little League. Retrieved 2011-08-24. ^ Big League Softball for Boys Archived 2012-01-27 at the Wayback Machine. Little League. Retrieved 2011-08-24. ^ Awards Recognition. Little League. Retrieved 2011-08-24. ^ Good Sport of the Year Award Archived 2009-11-06 at the Wayback Machine. Little League. Retrieved 2009-11-25. ^ Challenger Award Archived 2009-05-19 at the Wayback Machine. Little League. Retrieved 2009-11-25. ^ 2010 ASAP Awards Overview and Past Winners[permanent dead link] (national and regional). Little League. Retrieved 2009-12-06. ^ Bill Shea Distinguished Little League Graduate Award Archived 2009-08-26 at the Wayback Machine. Little League. Retrieved 2009-11-25. ^ Mom of the Year Award. Archived 2009-11-06 at the Wayback Machine Little League. Retrieved 2009-11-25. ^ George and Barbara Bush Little League Parents of the Year Award Archived 2009-11-06 at the Wayback Machine. Little League. Retrieved 2009-11-25. ^ Volunteer of the Year Award Archived 2009-07-24 at the Wayback Machine Little League. Retrieved 2009-11-25. ^ Howard and Gail Paster Little League Urban Initiative Volunteer of the Year Award Archived 2009-11-28 at the Wayback Machine. Little League. Retrieved 2009-11-25. ^ "Howard Hartman Award at Little League World Series" Archived 2011-06-07 at the Wayback Machine, Little League Communications Department, August 15, 2008. Little League. Retrieved 2009-12-06. ^ a b c d e f g h Little League Baseball, Incorporated. "Little League Baseball (or the Major Division)". Archived from the original on 2010-05-08. Retrieved May 12, 2010. ^ "Little League Announces Intermediate (50/70) Division". Archived from the original on 2013-04-15. ^ Little League Baseball, Incorporated. "Little League Challenger Division". Retrieved March 3, 2012. ^ a b c d "Softball – Divisions of Play". Archived from the original on 2016-09-13. Retrieved 31 August 2016. ^ Boys Softball Divisions Archived 2017-08-19 at the Wayback Machine. Little League. Retrieved 2011-08-24. ^ Divisions of Play: Girls Softball Divisions Archived 2017-12-19 at the Wayback Machine. Little League. Retrieved 2011-08-24. ^ Softball Division: Girls Softball Divisions Archived 2017-12-21 at the Wayback Machine. Little League. Retrieved 2011-08-24. ^ a b c d Little League Baseball, Incorporated (Jan 5, 2010). "2010 Redesigned Rule Books Now Available". Archived from the original on May 11, 2010. Retrieved May 12, 2010. ^ a b Little League Baseball, Incorporated (2010). "Little League Store - 2010 Baseball Rule Book". Archived from the original on June 11, 2010. Retrieved May 12, 2010. ^ a b c d Gub, Ted (July 29, 2007). "Who's on First? Who Wants to Know, and Why?". Washington Post. p. D1. Retrieved 2008-07-03. ^ "Pay Bill, See Offers, Check Email with My Verizon Fios". mysite.verizon.net. Archived from the original on 2009-05-31. Retrieved 2009-01-11. ^ "The BESR (Ball Exit Speed Ratio)" (PDF). Archived from the original (PDF) on 29 October 2008. Retrieved 31 August 2016. ^ "2017 Little League Rule and Regulation Changes". LLUmpires.com. 2017-03-13. Retrieved 2017-05-17. ^ "New Little League Intentional Walk Rules Change Strategy". GameChanger. 2017-02-22. Retrieved 2017-05-17. ^ "Current and Former Major Leaguers who have Played in the Little League Baseball World Series". Little League. Retrieved 2017-03-30.